A year-round arts and social justice training program for underserved youth from across the GTA that leads to mentorship and employment opportunities as well as an annual major exhibition for the public. Our annual multi-day Festival that takes place during Human Rights Month in December where filmmakers, subjects of documentaries, artists, educators and filmgoers come together to have some of our world’s most pressing conversations. The Hum is a podcast that cuts straight to the heart of human rights stories. Raw, honest and uncensored, from the people who have lived them first-hand. Real people. Real stories. Every other Tuesday. We take the magic of our annual Human Rights Film Festival and do it on a much smaller scale throughout the year. 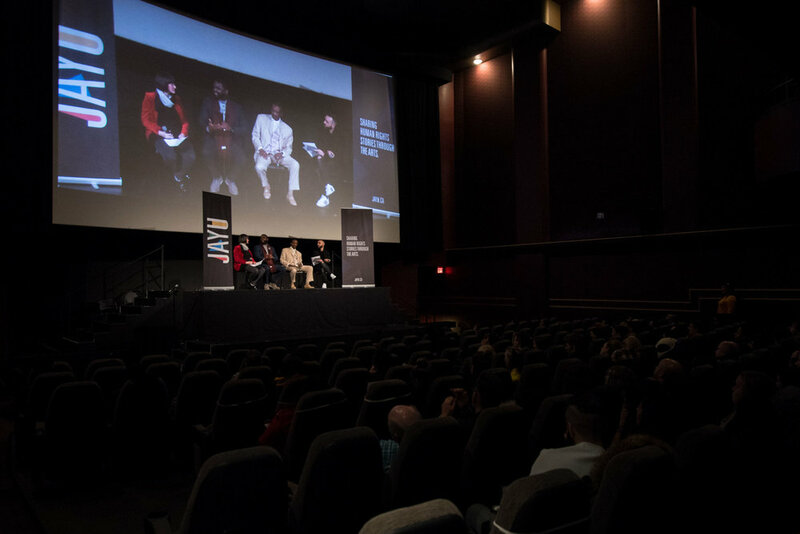 The Screening Series are one-off screenings that happen each quarter in cinemas across the GTA. In 2018, our programming led to several arts-based employment opportunities for underserved youth from across the GTA. Learn more about our impact below.